Out on the desert highway, the rule of thumb has a different meaning... and young Jim Halsey discovers just that when he slows down in the middle of the Texan wilderness to offer a ride to a gaunt figure by the roadside. How was Jim to know that this small kindness would change his life irreparably? Because when Jim Halsey let the Hitcher into his car, death, destruction and bloody mayhem came along for the ride. 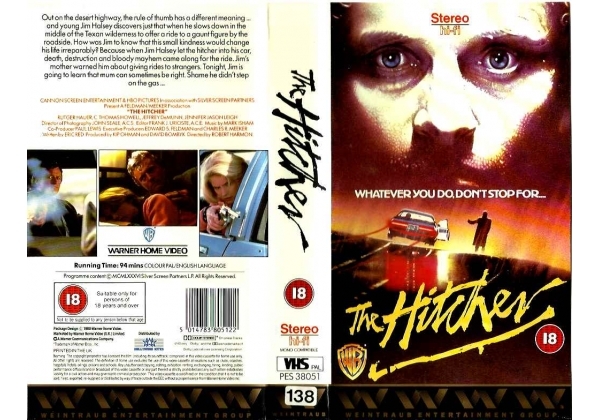 ©1986 Silver Screen Partners L.P.
Or find "Hitcher, The" on VHS and DVD / BluRay at Amazon.